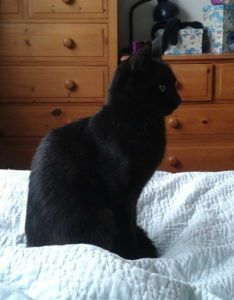 We have a new young rescue cat called Terence. The rescue centre advised us not to let him outside for at least two weeks, until he had bonded with us, or he wouldn’t come back as he wouldn’t consider it home. Isn’t he cute! He was found abandoned in an empty building; a neighbour was feeding him through the letter box. When two weeks had passed he seemed settled – he seemed to love being with us! So I let him out in the garden, but the second time I let him out he was away so long I thought we had lost him. I went round the garden and up and down the road, shaking the biscuit box calling ‘Terence’ (sorry, neighbours!) and eventually we got him home. Phew! In the parable of the lost sheep, the shepherd leaves the 99 grazing safely on the hillside and goes to look for the lost sheep. How happy the shepherd was to have found his lost sheep! I felt a bit like that when I finally got Terence back. The Lord doesn’t want any of his little ones to be lost. That’s why we write stories, to help them find the way home. P.S. Final call if you would like to join our monthly programme: I will be sending out the material tomorrow morning. This month we are taking a long, hard look at how to finish chapters. Sounds simple, but there’s more to it than meets the eye, and you could pick up some good tips for your work in progress! The programme costs just £5/month but the first month is free, so you can try it out for nothing (and you’re not tied in at all, you can cancel at any time). I also set writing exercises for you to do, so it’s not just information, it’s practical. If you want to go deeper with your writing, if you are a Christian writing stories for young people, this programme is for you. In the last year or so we have looked at theme, dialogue, adverbs, voice, conflicts, humour and loads more, so if you don’t want to miss anything else, join now! You can read more here. ← Whether the Weather . . .